One pot, 30-minute, Whole30 compliant meal of dreams. 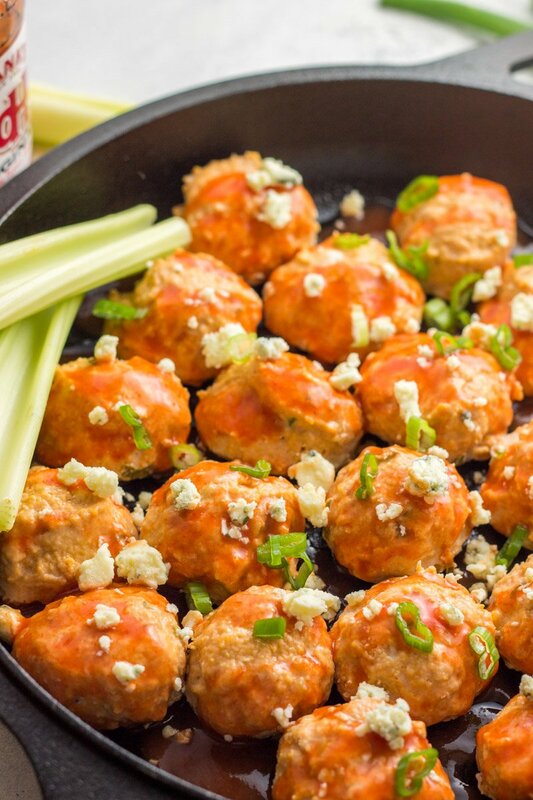 These Whole30 baked buffalo chicken meatballs are an easy, family-friendly meal on rotation. “I’m gonna do a Whole30 this month!” I say enthusiastically as my husband gives me the biggest eye-roll ever. “Ughhh no!!! !” is the response. Every.Single.Time. Been there? The entire idea of ‘healthy eating’ sends my man over the edge. He gets as frantic as my toddler does when his little brother is trying to touch all the toy trucks. It wasn’t until this last round that the hubs actually admitted he liked when I was doing Whole30, for the mere fact that meals are much more planned and actually tastier than my no-thinking dinners…aka throwing something on the grill or the same meal every four days. I wish I could have got it in writing, “I like when my wife makes Whole30 meals”. Because guaranteed the next time I dive into another Whole30, he’ll groan and moan like always, then later pat me on the back. It’s a common theme. 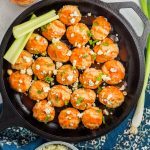 But I had a hunch THIS recipe, Whole30 baked buffalo chicken meatballs, was going to send me to heavenly-wife-I’ll-never-leave-her status. ‘Cause the man loves buffalo chicken. Almost more than me. I, on the other hand, honestly don’t ever eat buffalo chicken anything. I KNOW, I’ve been living under a rock. I thought buffalo chicken meant ‘burn my tongue off’ and that kind of thing I just can’t do. Blame it on my Midwest roots – I just don’t eat ‘hot stuff’. So these were explicitly meant for him. Damn, I AM a good wife! To my surprise, I loved these too. And I didn’t feel like a fire-breathing dragon after eating them. What?! WHAT?! Am I a buffalo chicken fan now?! I think I am – my life forever changed. And….wait for it….my toddler liked them too. DOUBLE WHAT?! 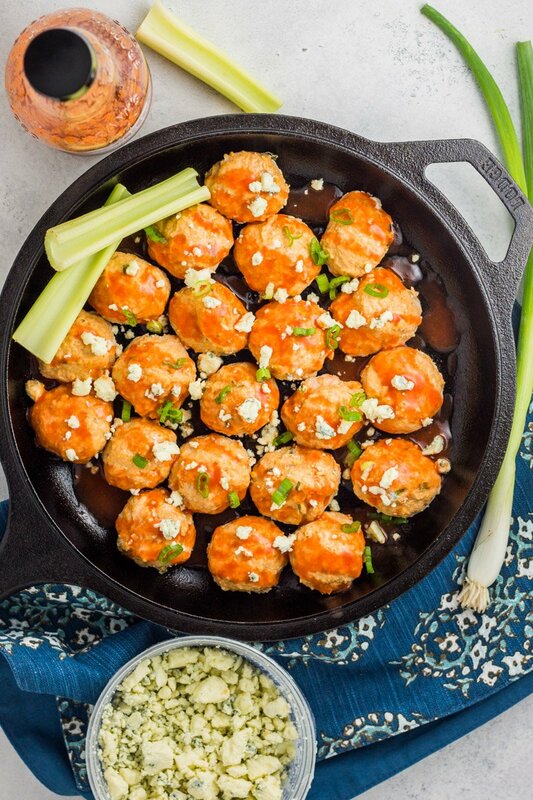 I haven’t even shared the bestest best best part – I whipped these Whole30 baked buffalo chicken meatballs up in less than 30 minutes from prep to plated. Can you hear the angels opera-singing and the clouds parting? It’s THAT miraculous. Simply preheat your oven to 400 degrees. Next, combine all the ingredients into a large bowl and use a medium cookie scoop like this one (you could certainly use a normal spoon, but a cookie scoop is easier and requires no molding), to spoon the ground chicken into balls and place on a greased baking sheet or cast iron skillet (click here for the set I have and love). The mixture will be wet, so they may not be perfectly-molded balls, but as long as they hold together! If the mixture is too wet to mold, add a little more almond flour. 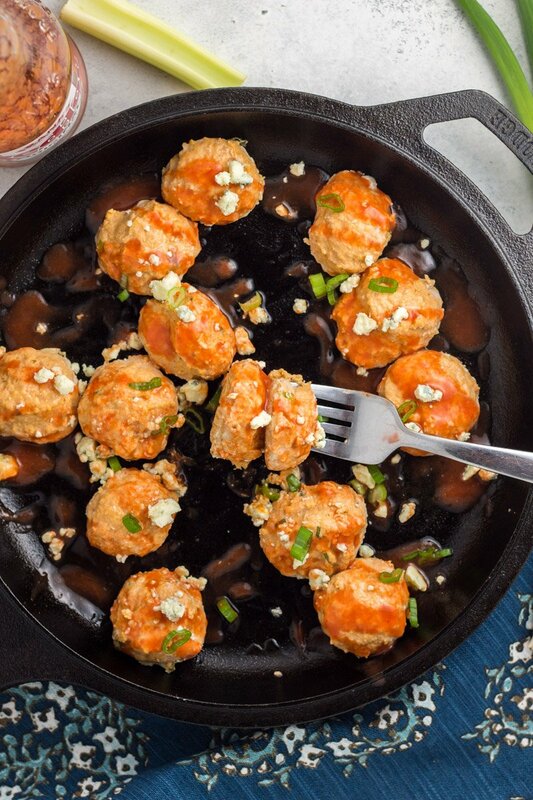 Buffalo chicken never tasted so good, never cooked so healthy. Getting all the husband’s of the world totally jazzed about Whole30, once and for all! If using homemade paleo mayo, make this beforehand and refrigerate before serving. Get the recipe for mine here. Omg my husband is going to LOVE these, buffalo anything is the key to his heart!! I too am from the Midwest 👊🏻 and I’m slowly loving the heat of some food! Hahaha you (and your hubby) are my people!! Unfortunately I don’t! One of my many to-do lists for my recipes! Is the Franks hot sauce whole 30 compliant?? It is 🙂 The original version. Same! I think I’m totally converted now! As is my hubby with Whole30 (LOL)! Looks delicious! 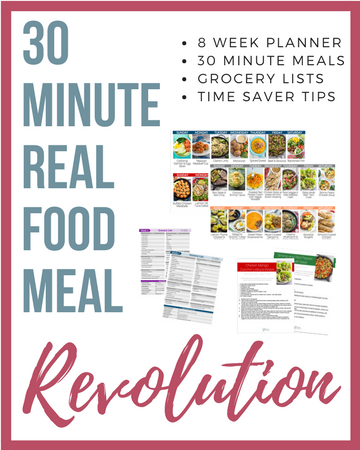 And I need some new meal ideas to get me through my last week of whole 30 (can’t do zoodles with marinara or fajitas anymore!) What do you suggest serving with these? Hahaha true dat!!! We loved them with compliant coleslaw but I’ve also done roasted cauliflower with them! These look so good! I love recipes with ground chicken, they’re so flavorful! Thanks so much Cara! I’m starting to play with ground chicken more, and I love it! Hello! Have you ever used ground turkey? Wondering if it’s similar? Have all ingredients except ground chicken 😩 I do have ground turkey though! And this mama does not want to go to the store if it’s similar! Thanks in advance! Big fan! I haven’t but I’m sure they would be just as good!! So glad you found me! These are amazing and so easy! I doubled the recipe and used 1 lb ground chicken and 1 lb ground turkey – so good! P.S. I’m a fellow North Dakotan 😉 and know your future sis-in-law Annie. Love your blog! <3!!!!!!!! So glad you found me! Annie is the BEST! So so so happy you liked these! Great idea for improvising with these a bit too! This recipe looks SO good! 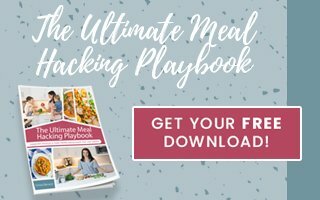 I’m totally putting on my June meal plan! What do you eat with these? I’m super new to Whole30 and am at a loss for sides… I used to always eat rice or potatoes with almost every meal! Yikes! I’m guessing lots of veggies? Thanks so much! Could I use coconut flour instead of almond flour? I’m never quite sure if the 2 are interchangeable! Really excited to try these. Thanks for posting! Hmmm they are definitely not interchangeable, but you might be able to make it work! I would add more coconut flour than what the recipe calls for in almond flour. Just start out tablespoon by tablespoon until you get the consistency to be able to mold them. Let me know how they turn out! Hey! I just wanted to say I tried this with coconut flour and it turned out just fine. I would definitely use a little more than the recipe calls for. Oh great! Thanks so much for sharing! Thanks for taking the time to comment, Jamie. I was wondering! Wow! These were delicious! My entire family devoured them. Thank you. I’m going to make a ton and freeze them so we can always have them at the ready. Let me know how the freeze! I haven’t tried it. Yummmmm! Just made these and they are amazing! 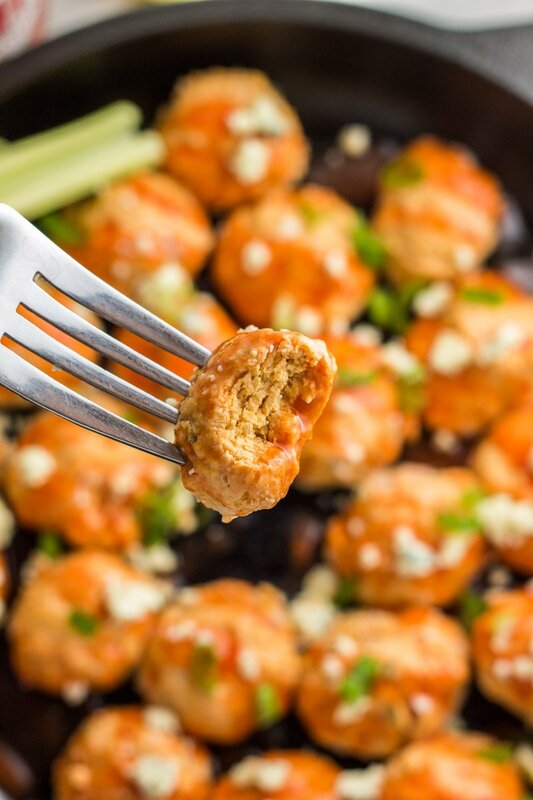 I love buffalo flavored things and there aren’t many whole30 buffalo recipes out there. Thanks so much! So glad you enjoyed these Sarah! I just made these and love them! Is it normal to have white foam/fat around each meatball? I just tried to brush that part off. What is something you could use besides the Mayo? Thanks! Hmmmm you could maybe try to just omit entirely or add a little coconut cream instead! Would brown rice flour work? These look great! I would think so! You may not have to use as much with brown rice flour. what can I replace hot sauce with? I would like to make these for my son and I think hot sauce may be too hot. Would topica flour work as he allergic to nuts? Frank’s Red Hot original is. The only ingredients are cayenne red peppers, distilled vinegar, salt, and garlic powder. The buffalo sauce from Frank’s is not compliant. Thats the buffalo wing sauce.. They plain one does not have that. Hi, what is the serving size for this recipe? Thanks! Depending if you serve them with side, this would feed anywhere from 2-4 people. Typically four. I’ve tried making these twice now- the flavor is great and we really enjoy them, but every time I pull them out of the oven, there is a weird white film that comes out of the meatballs and covers the bottom of the pan. I pull it off before serving, but how are you making them without this happening? Super normal. It happens to me too. I just remove it or wipe it off. Do you have the nutritional facts for these? My 11 month old son devoured about 5 of these! They were incredible!! We added in minced garlic and red peppers and they turned out excellent! My kiddos love these too Meagan! Glad they were a hit at your house too. How are these Whole30 compliant if you’re using blue cheese? Cheese is not allowed in the program, you are correct. Like the recipe states, you should omit if you are doing a Whole30. Do you think these freeze well?Alway looking for make-ahead options for a WHole30. I haven’t tried it, but I could see these freezing well! How are you not embarrassed as a female to write sexist trash like this? The meatballs are definitely good but this crap is right out of 1955. Did you also give your a hubby the bestest best best hummer right after you did the dishes? Hi Janine – I have absolutely nothing to be embarrassed about. In fact, I’m HAPPILY married but sad you feel the need to attack. I hope you have a better day. This is in my regular rotation. Soooo good! Sometimes I sub diced yellow onion for the green onions if I don’t have them on hand (and ground turkey for ground chicken). Thanks for an awesome recipe, Chrissa! Great recipe, thanks for sharing! I made this tonight, it was so easy to make and delicious. Can’t wait to have my 11 month old try them tomorrow 😊 I think he will love them! I’m glad you liked it Tina! I made these last night. So good! Even my daughter loved them. Thanks for this recipe, will be in our rotation. I’m so thrilled to hear that! We love these!! We use Tessemae’s mild buffalo sauce instead of Franks because I can’t do anything too spicy. They are amazing! Thanks for a great recipe! Ooo I’ll have to try that. Thanks Katie! Hey Chrissa! Do you think I could make these and freeze them? Would they be better frozen and then cooked OR cooked and then frozen to be warmed later? That would save so much time if I could prep them and have on hand for quick dinners! Hmmm I havne’t tried freezing these. I would guess it’s better to freeze them raw. I worry they will be dry if you cook them, freeze, defrost and consume later. Keep me posted if you try it! Hi – I made these last night and I LOVE the flavor and recipe. However, I had trouble with the meatballs keeping shape, once I started baking they sort of melted/lost their shape. Do you have any recommendations for firming them up a bit? I first tried to cook them on my cast iron but its a grill pan type of cast iron. That did not work, so I switched to baking the rest in the over on a sheet. I made these but didn’t have almond flour…so I tried subbing Gluten free flour and they are yellow blobs 🙁 They kind of taste like eggs and sausage. haha! Fail. But I mean they do taste good…. Does the flower make that much of a difference? Yes, I do think flour makes a difference. I’d stick to the original recipe and see if that helps! These were a total and complete mess! I had to add a TON more almond flour to even be able to make “balls.” Also, blue cheese isn’t Whole30 compliant…??? Blue cheese is optional and state in the ingredients. Sorry you had trouble getting these to stick! I made these last night and unfortunately they didn’t turn out too good. They tasted great but they lost shape and turned into more like chicken pancakes rather than chicken meatballs. Do you know why that would have happened? I followed the recipe exactly. They also were in a pool of oil/fat when i took them out of the oven. Maybe not enough almond flour? They do fall a bit since ground chicken is so wet and lean. The fat the settled around them is normal – similar to any sort of meatballs you might make (beef does this too). You could try adding a little more almond flour next time to keep their shape better! My family LOVES these meatballs!! I make these on a weekly basis. I can say for sure that you must use ground chicken. I made the mistake of buying ground turkey instead and they were not as good. I actually disliked them. Let’s not forget they are Whole 30 compliant and that’s a great recipe in my book!! Thanks for the info Suzanne!